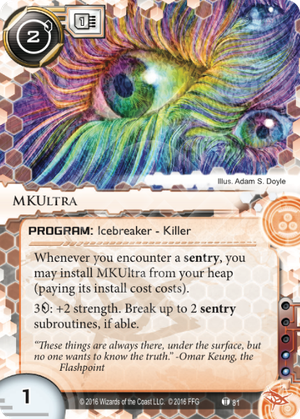 Whenever you encounter a sentry, you may install MKUltra from your heap (paying its install cost). 3credit: +2 strength. Break up to 2 sentry subroutines, if able. The following is a review of the flavor of the card, rather than its usefulness. I've seen some questioning over this suite of breakers, as to whether they should be attributed to Null or Omar. Given the conspiracy theory flavor of this suite, I think they're definitively in Omar's camp. For example, Project MKUltra was a program undertaken by the CIA, in order to study means of controlling the minds of prisoners, and even foreign leaders. Funnily enough, it was descended from Operation Paperclip. Through human experimentation, it was hoped to assist in the development of drugs and other means of coercion (more accurately, torture) to elicit confessions and secrets from captives. It was largely a response to alleged use of mind control drugs on U.S. prisoners of war in Korea. Beginning in the '50s, it lasted until an official termination in 1973. A number of activities in this project were illegal, including experimenting on human subjects who neither agreed to nor had knowledge of such experimentation. "Tests" included the administration of drugs (particularly LSD), hypnosis, sensory deprivation, and all manner of abuse (verbal, mental, and sexual). A number of organizations (including colleges and pharmaceutical corporations) were used as fronts for the CIA-run program, though many of these businesses had no knowledge of CIA involvement. The name of the program is indicative of secrecy, as well. "MK" denotes that it was sponsored by the CIA's Technical Services Staff (OTS), and "Ultra" was used to indicate the high level of confidentiality associated with it. When knowledge of the program first came to light, the CIA Director of the time (Richard Helms) ordered the destruction of all MKUltra documents. Much of the program remains shrouded in mystery, as a wealth of information was destroyed. A significant portion of available knowledge was obtained through interviews with those involved, be it the experimenters or the test subjects. What is known is that this program consisted of over 150 individually-funded research sub-projects. Known MKUltra deaths include Frank Olson, a U.S. biochemist who was given LSD without his consent or knowledge. His suspicious death was deemed a suicide, as a CIA doctor assigned to monitor Olson claimed Olson walked out a 13th-story hotel window, falling to his death. Olson's family claims he was murdered to prevent him from divulging any confidential information in his drugged state. As for the flavor text, it's certainly applicable to this historic project. We all know the government has secrets, and though many try to uncover them, I think a great many more would simply prefer not to know the truth. So, in fitting with Omar's place as the resident tinfoil hat wearing theorist of cyberspace, this program is clearly part of his repertoire.